The teaming up of del Toro and Hogan to create this trilogy has turned out to be a pretty haunting affair. “The Strain” (the first book in the trilogy) introduced the horror world to a different view of vampires. This time around the heroes are not the vampires or are the vampires the subject of lustful desire, instead the mythology of vampires returns to the dark horror of life stealing blood suckers to be feared and staked or in this case killed with silver. Some other twists that del Toro and Hogan have added are; instead of fangs the vampires have stingers under their tongues, the spreading of vampirism is through parasitic virus-like blood worms and that there are seven “Ancients” that basically are the leaders of the vampires and have been around for centuries. The story behind the “Ancients” is where this book focuses. The first book told of the spread of the strain of virus turning New York City back to ground zero, this time for the spread of vampires. The heroes are Abraham Setrakian, a proffesor from the old world who has been hunting vampires since before World War II, Dr. Ephraim Goodweather a formerly with the CDC, he was listed as a criminal when he tried to alert the world of the vampire invasion, Eph’s Son Zach, whose mother was turned and is now hunting him, andFet an exterminator who now has a new form of vermin to hunt. Setrakian has revealed to all that he has been hunting “The Master” for most of his life and that “The Master” is responsible for the sudden influx of vampires in the New World. The Ancients have all been around for centuries and have maintained their anonymity, so why now do they become public and seek to ponentially wipe out their food source? The secret lies behind the Master. Setrakian, Fet, and Eph join up with a battle force from the Ancients in order to prevent The Master from completing his plans. Using silver weapons and UV lamps to battle the vamps the various skirmishes lead up to one big battle with The Master. A new character brought into this story takes part in the final battle and has some great fighting styles throughout the book. His name is Angel and he’s a former wrestler turned movie star, not a normal wrestler but a Luche Libre, a masked Mexican Wrestler. His movies usually had him pitted up against vampires, but nothing like he’s experiencing now. The reader, Daniel Oreskes, does a great job of reading this book, his voice adds to the drama and horror underlying the story and at the same time he is able to allow the listener to discern between who is talking/thinking by subtle vocal changes. 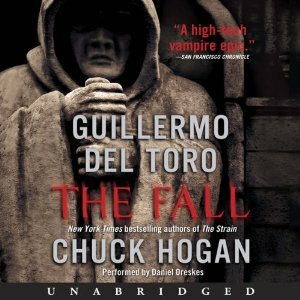 The nice thing about this audiobook, in that it is part of a trilogy, but del Toro and Hogan write enough of the backstory so that if you were to jump in with this book instead of the first or that a long span of time passed between books, you wouldn’t be lost in what is going on. Don’t get me wrong though, read the first book, because both of these stories have some great storytelling of epic proportions. Once again it’s time to dive into the stories from the golden age with a sea adventure from L. Ron Hubbard. This time around the motto is “Semper Paratus” (Always Ready), that’s right we’ve got a Coast Guard adventure. With this story Hubbard has thrown in some rescues, pirates, drug runners and of course a dame for the hero to fall in love with. As is usual with the Galaxy Audio productions, you will be swept away on this sea adventure, through the superb voice acting, sound effects and music. All these combine to create an audio version of a pulp fiction piece, an audio pulp, or better yet a leap back to the radio shows from days of old. Good times to be had. This story was originally published in “Five-Novels Monthly,” January 1935, and tells the story of Chief Petty Officer Johnny Trescott and how he attempts a rescue, gets captured by drug runners/pirates, escapes and tries to save face. While out chasing down a notorious drug runner in the Gulf of Mexico, Trescott’s patrol boat gets a distress call from a downed plane that is sinking. The passengers on the private plane will lose their lives if Johnny doesn’t act fast. Breaking off his chase he has the boat search for the plane. Just as he gets the plane’s passengers and crew onboard and headed for safety, the drug runner ship is seen closing in, having heard the same distress call. Johnny cannot get his boat powered up to full run before the criminals board. With a bit of a fight Johnny, his crew and the rescuees are captured and taken prisoner to a small island off the coast of New Orleans. The drug runners take the stolen Coast Guard boat and use it to raid other ships in the Gulf. Johnny plans an escape in order to bring back help, but when he arrives on base in New Orleans he is arrested for piracy. The officials think Johnny stole his own boat and is responsible for the raids. Johnny must escape another prison, capture the drug runners and come back in order to save face. With some exciting battles and a great storyline, this sea adventure will keep you on the edge of your seat whether reading the book or listening to the audio book. Definitely some fun times. Like I say, every so often you have to go back and revisit the classics. This time around I decided to listen to a tale that has been portrayed as a horror story, but in reality it is the exploration of man’s darker side. I’ve seen the 1931 film starring Frederick March as the lead and while the movie focused on the horror side of things they did a pretty good job of showing the duality of man. But the idea of drinking a potion to become a monster has been the bulk of what popular culture relates back to the Robert Louis Stevenson tale. One of the reasons I decided to give this book a listen was two-fold; 1 – because it was an audiobook and I could listen while I worked around the house, showered and commuted to work, after all a good audiobook can make a great soundtrack. 2 – because this book was read by Scott Brick. I’ve always enjoyed listening to Scott Brick narrate books, he puts emotion into the readings that are subtle yet effective. This time around, Brick brings to life the many aspects of late nineteenth century London. 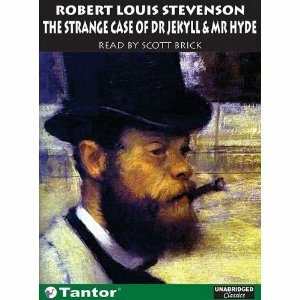 The book covers the piecing together of the story of how Mr. Edward Hyde can be so ruthless and yet be the man the Good Dr. Jekyll has bequeathed everything to through his will, and then through written correspondence from Dr. Jekyll is fully realized as he confesses to his exploration of the split personality through chemistry. Hyde is observed brutally knocking over a child and when confronted offers no apology, instead he buys his way out. The problem arises when Jekyll discovers his original formula was tainted and after ordering the chemicals for more of his personality splitting concoction, finds they are pure and he cannot repeat the original without first finding what was the impurity in the original. The original formula allowed him to shift back and forth at will between the two personalities. The later formulas allow Hyde to take over without ever getting control of his situation. But Jekyll has a plan and will sacrifice himself to save humanity from his dark side. Hey this novella is not too long of a read or listen, so do yourself a favor read a classic and enjoy some mystery with a little philosophy thrown in. The tension builds, the excitement mounts, the story continues and soon comes to a close. It is a bittersweet emotion I feel as I just finish listening to the second of three parts that make up the final audio book in “The Demon Wars Saga” by R.A. Salvatore. The adventures continue but I am saddened to know that there is only one more audio book left before the end of the saga. This series introduced the world to the Ranger Elbryan, who was trained by elves to protect the citizens of Honce-the-Bear, his wife Jilseponie who was trained by a renegade monk, soon become a Saint, who taught her how to use the magic gemstones. Bradwarden the Centaur, Bellimar Juraviel the elf who has trained rangers through the ages and many more heroes. Salvatore also introduced some great villains such as; Marcalo De’Unnero the were-tiger monk who seeks to rule the Abellican Church, Father Abbot Marquart who was possessed by the demon dactyl, Bestus Belzibar. In this audiobook, the son of Elbryan and Jilseponie, Adryan, who has become king through a technicality seeks to conquer the world. Adryan was taken from Jilseponie’s womb by Lady Dasselrond, the leader of the Tu’elafar, the elves of the north, and raised as a ranger in hopes that he would save their land. It turns out that not letting the child or the mother know of each other’s existence has stained Adryan’s view on life. Adryan left the elves and found the renegade monk De’Unnero and under his tutelage, sought and killed to gain the throne. Now he seeks to conquer the world. Those that don’t bow to him will be destroyed. Adryan has sent emissaries to Behren to conquer the southland. The land of Behren has just found out that their religious god head was a fake, and the country is in turmoil. Adryan hopes to take this confusion and use it to his advantage. The problem is that Brynn Dahrielle has just freed her people, the To-gai, from Behrenese slavery, and only sees Adryan, a former friend, as another slaver. To exact his revenge Adryan first must destroy Lady Dasselrond and the elves. To do so he must find Anderblok Innerness, the land of the Tu’elafar. Dasselrond sacrifices herself to hide the land. It can now only be found once Adryan’s blood has been spilled. The elves are homeless without a land and seek out Jilseponie to offer their assistance in defeating Adryan. Jilseponie has gone to the north to aid Prince Midalis, brother to the king slain by Adryan. Juravial finds Jilseponie and Bradwarden and offers his magicks to tie all the forces together in that they may destroy the false King Adryan. At the end of this audiobook the major battles begin, now I must get to the finale, but I don’t want to rush it, I’ll be saddened to reach the end of this epic saga. But the excitement awaits. I’m really loving the vast array of genre’s from L. Ron Hubbard’s pulp fiction days. More to the point I’m loving the production work of the Galaxy Audio releases of these stories from the various genres. During the mid-20th century Hubbard wrote numerous stories for the numerous pulp fiction magazines that were published during the time. What got me hooked were the science-fiction and fantasy stories, which are my favorite genres of any literature. After listening to all the Stories from the Golden Age in the sci-fi/fantasy genres I was highly impressed by the production of each audiobook. Galaxy Audio, part of Galaxy Press, is releasing all the old Hubbard stories to create these 2 hour audio pulps, that bring to mind the old radio dramas from around that same time. Each one of these audiobooks is a flash back to when stories were fun. Galaxy Audio has a great team of voice actors for the books and the sound effects and music are superb. Just picking out any book will get you hooked. This time around I listened to one of Hubbard’s Tales from the Orient, “The Falcon Killer,” which was originally published in April, 1939. This story takes place in War-torn China in the early part of the 20th century. This is the story of an ace free-lance fighter pilot, nicknamed “The Falcon Killer (Tzun Kai),” who is actually Bill Gaylord, raised in Peking by his American parents. Gaylord lost both of them as a child during the violent Boxer uprising and then saw his foster family slaughtered in wartime. With a past that’s hardened his soul and given him nerves of steel, Gaylord has used his resolve to down more Japanese aircraft than can be counted. Gaylord has a tattoo of a half dragon which has some meaning that only the Chinese know. This tattoo provides the great twist at the end of the story that makes this a true Hubbard pulp-fiction. Events pit Gaylord against a Japanese spy who has caused untold trouble for the Chinese. Gaylord must somehow find and defeat him or risk losing an ancient Chinese kingdom to the land of the rising sun. Just before the local ruler can sell out his people Gaylord is discovered to be within the town and is called join the ruler for dinner. Gaylord discovers his dinner has been poisoned, but will it be too late before the Japanese move in and take over, creating one more province under the rising sun banner? This story has some great aerial battles, escapes and intrigue that will keep you wondering whether the Falcon Killer will live to see another day.